I’m a Youtube fan. I love that people can create videos and express themselves in this way. There are some great video creators out there and content that teach as well as entertain. I thought I’d highlight some of my favourite channels today! Learn History and Science on this Vlogbrothers channel in a fun and understandable way. I’ve been making my way though the history section. Speaking of, the Vlogbrothers was one of the first site I subscribed to. I love the videos that Hank and John Green make and I love the little community (well, rather large community) that they have built. There are funny videos, thought provoking videos, videos on current events, and they are all thoughtfully made. Also, I’m a fan of John Green’s books! Two guys from across the pond; Charlie and Alex have very different channels, but I find they both have some interesting videos. Charlie is just a funny guy and I find myself laughing at a lot of his videos (which are well made). I actually first started watching his videos after seeing his How to be English video. Alex also makes some funny videos, especially his reading of Twilight. He’s also one of the creators of Sopio, a fun card game. One of my favourite cooking channels is Sorted. They make quick and easy dishes and they are a lot of fun to watch. Annnd, they made a dish based on something I requested (a long time ago and with a few other people). In late September, I received my letter email inviting me to sign into Pottermore. After a bit of excitement, confetti and general happy making, I sign in, for the first time, to the newest Harry Potter experience. 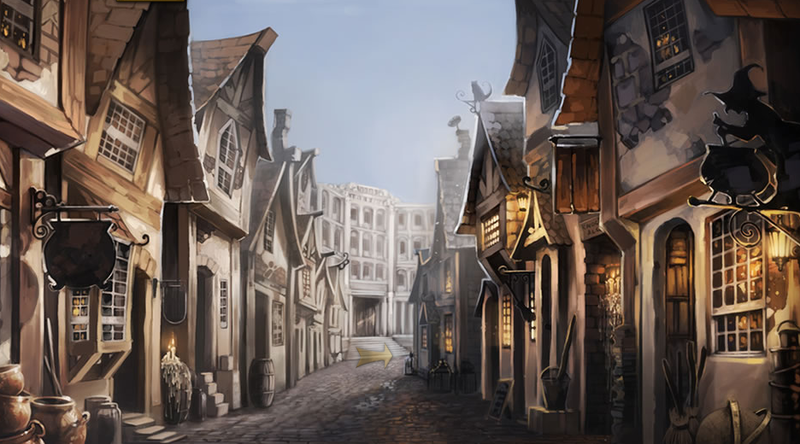 Pottermore choses a username for you, so I’m AsphodelPurple124 (find me; friend me) and then it takes you on an adventure through the first book in the series. Each chapter contains several sections with hidden messages, items and exclusive content from J. K. Rowling. I love the graphics and what they did with the site. However, I’m hoping when they come out of beta there will be, well, more! I love the chapter explorations, but it would be nice if they implemented little mini-games, or more background on the characters. I was under the impression that JKR had a ton of background information on characters that never made it into the books. Short stories and such will add a lot more to the experience. You get to walk through Diagon Alley where you can get money from Gringotts and shop in some of the shops. It’s a lot of fun, until you realize that you can only buy from three or so store. Even if you couldn’t buy, it would be nice to walk through other stores. In Diagon Alley you can go to Ollivanders to get your wand. But remember, it’s the wand that choses the wizard, so you can’t choose your own wand, but you will get to answer a few questions. 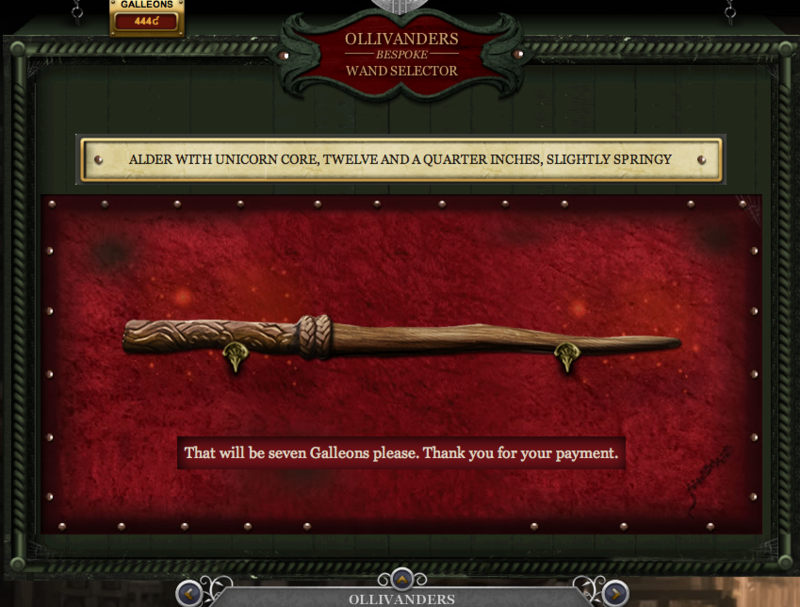 Minor disadvantages of unicorn hair are that they do not make the most powerful wands (although the wand wood may compensate) and that they are prone to melancholy if seriously mishandled, meaning that the hair may ‘die’ and need replacing. After purchasing your school things and boarding the Hogwarts Express, in chapter seven you get sorted with the rest of the first years. 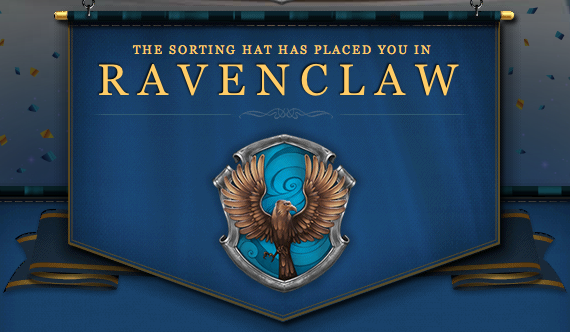 I got sorted into Ravenclaw! While I’ve always claimed that I’m a Gryffindor, I knew that I had more Ravenclaw-ish traits than Griffindor, so, I don’t mind. The sorting is a bit of a personality test, giving you a number of multiple choice questions and placing you into the house depending on your answer – or that’s what I think. It could also be randomly selecting since all the houses seemed to have an even number of members. After being sorted, you gain house points as you collect items from each of the chapters. Currently, only the first book is available, but I’m curious to see what the other books will look like. There are other things that you can do around the site, brew potions, cast spells (though, this seems a bit spotty at the moment) and duel – which, was not working when I last played. I’d like to see how they will publish the ebooks; since Sony is hosting the site, I’m hoping they don’t do sell it in Sony-only format. That would be upsetting. I’m looking forward to seeing the site outside of it’s Beta form. I’m looking outside my window and seeing the brightness of sunlight streaming in. Yet, I can experience the longest lunar eclipse in this decade (which is still going on as I type), thanks to National Geographic and Youtube. The Best Google Doodle Ever. I woke up this morning to Google’s newest Doodle and I have to say, they’ve outdone themselves. In a tribute to Les Paul, Google has put out a playable instrument as their doodle. You can use the middle row of keys on your keyboard to strike each of the 10 strings. But, what makes this exceptional is that you can record what you are playing and they generate a link to it so you can share! Go ahead, play your heart out. 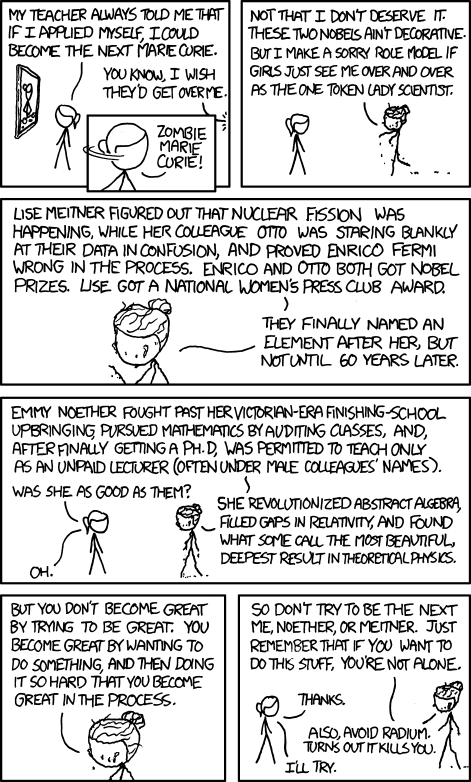 Fantastic quote, Zombie Marie Curie. Excellent. I remember reading these books …. last year … when I bought them for a little girl’s library collection. All children should have a library started for them! That way they have a lot of books to read when they are ready. I don’t recall reading them when I was younger. I read other things, I’m sure. These books are fun for kids though. Is there a Little Miss Clueless? That might have fit me well growing up. I’m online a lot. Sometimes I wonder, where do I spend my time online? Luckily, Chrome allows you to see your most visited sites and so I present, Shanella’s Most Visited Sites. Not surprisingly, Google is the most visited site. I check Google for everything! If I need to figure out a word’s spelling – Google. If I need to look up a definition – Google. If I want to do a search – Google. Want to check the news – Google. Want to look up the weather – Google. Want to find a picture – Google. Looking up a movie – Google. Want to access all other Google sites – Google. It’s just the launchpad for everything else. Facebook is the next used. I’m usually logged into Facebook on Chrome, however, the interesting thing about this is, while Facebook might be second used, I hardly go to the page for personal things! Sure, when I get an alert on TweetDeck I rather view the post on Facbeook, however, 80% of the time spent on Facebook is work related! Next after that is WordPress, and this is probably because of BEDA. It might also have to do with the fact that I just got shanella.com and went through a lot of late night and weekend testing this past weekend. After that I have Gmail*. Now with Google’s switching account implemented, I have three Gmail accounts that I check throughout the day. Following closely behind – and a surprise site – is Yahoo Mail. I didn’t realise that I checked Yahoo almost as much as I check Gmail, mostly because I get a lot of junk email to that address. Perhaps it’s because of that and my constant clearing out of that account that I check it as often as it says. I’m not too surprised at this next site. When I first got a tumblr I was on it 24-7! Now I’ve calmed down a bit, but I still do have two sites on Tumblr so it’s not surprising that it’s in the top 8 most visited. Next up is Twitter. This is probably because I have two twitter accounts, one that is personal and one for the book tumblog so while the personal account is logged into all the Twitter apps, the book blogging twitter is logged on via the Twitter webpage. I wonder how many people actually go to the twitter page versus just using a Twitter app. * Gmail took up two entries because of the address mail.google.com and gmail.com. I’m sure if those were all counted together it would be right behind google.com.